﻿ Create your kids photomosaic! When a child is born, every day in the family is an important, joyous event in the life of the parents. And a camera is always at hand during these moments! The first smile, the first tooth, the first family photos of beaming parents with their children, kindergarten, the first day of school, grandparents and more...the list goes on and on. With the advent of digital cameras, hundreds and even thousands of kids photos are in family archives — and this number is only growing, thanks to technology. The biggest events and moments are recorded on camera; each photo is a frame from a child's quickly changing, active life. Children's photographs are always pleasant to behold! The most-awaited and enjoyable present for grandmas and grandpas are photos of their grandkids — although these photos certainly bring a smile to their parents too! There are a number of programs online for working with photos. Standard photomontages are no longer as impressive as they once were. Parents always want to come up with something new and original... An excellent idea has appeared, thanks to Artensoft™. 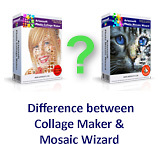 Artensoft is the developer of Artensoft Photo Mosaic Wizard, a program for creating interesting, realistic and top-notch kids photomosaics. A kids photomosaic is a main photograph made from a large number of smaller kids photographs. At a distance, the photo looks like a single picture. But on closer inspection, you can pick out all of the photos that the photomosaic was made from. This is a sensational find for creative parents who want to do something artistic. To make your own photomosaic, all you need is a collection of photos and the desire to make something truly interesting. If you don't have enough kids photos, you don't have to limit yourself to just them: simply add any other snapshots that you have into the collection. The number of photos you load will make the photomosaic spectacular: the more photos, the better! You don't need special skills to use the program. Just follow the program's step-by-step instructions. See it for yourself: download the program for free and try using it. Kids photomosaics make a fine gift for grandparents, an unusual and interesting photo, and proof of the imagination and creativity of the parents themselves!